Nicotinamide adenine dinucleotide (NAD+) is critically important to the function of all living cells, as NAD+ is a cofactor required for the enzymatic processes that generates energy within the cell through the ATP cycle, both in traditional oxidoreductase reactions and as a signaling molecule for reactions catalyzed by sirtuins and PARPs. This control over mitochondrial and cytoplasmic pathways contributes to diverse metabolic function and enables pleotropic effects across many organs, regulating metabolism, mitochondrial health, stem cell rejuvenation, neuroprotection, and longevity. Figure 1. Diverse metabolic actions of NAD+. Schematic overview of how NAD+ and NADH are used as metabolic cofactors, either in more traditional oxidoreductase reactions (green NAD+) or in more recently discovered roles as a cosubstrate for the reactions catalyzed by sirtuins and PARPs (red NAD+). Note: reactions shown here are only a small representation of those that involve NAD+. Figure 2. Metabolic control by modulating NAD+ levels. 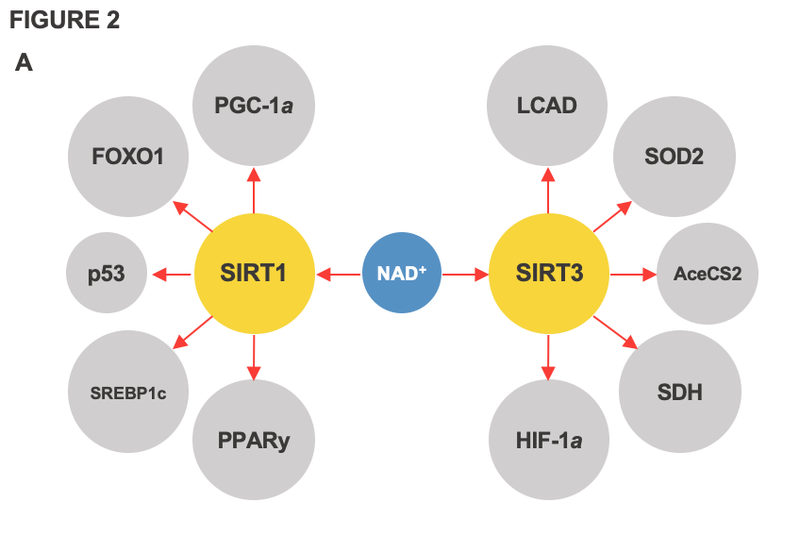 (A) NAD+ levels dictate the activity of SIRT1 and SIRT3, which in turn regulate a variety of metabolic proteins. The protein targets shown here just represent a selection. (B) Mitochondrial function is regulated by sirtuin enzymes, notably SIRT1 and SIRT3, which are under the control of NAD+ levels. Modulation NAD+ levels results in improved mitochondrial function with clinically beneficial effects. Since NAD+ is too large to cross the outer cell membrane and into the mitochondria, the cell uses a variety of its own NAD+ precursors to replenish NAD+ levels. However, reduced levels of NAD+ are linked to aging and numerous diseases, including mitochondrial dysfunction, inflammation and a variety of associated diseases. These levels decline as humans age and remain depleted during disease states. Preclinical evidence suggests disease- and age-related functional decline can be mitigated by boosting NAD+, which supports the Metro International Biotech hypothesis that maintaining optimal NAD+ levels may allow humans to lead longer and healthier lives. In preclinical, proof-of-principle studies, increased NAD+ levels have been shown to induce mitochondrial biogenesis and enhanced natural pathways that are key to improving mitochondrial health, such as sirtuins and PGC-1alpha. Over 50 rare diseases are categorized as rare mitochondrial diseases, which can often have serious effects on skeletal muscle, cardiac muscle, or the central nervous system, for which there are few available therapies and a high unmet medical need.